We are often asked why we return to Paris so regularly, instead of expanding our horizons. Paris does, however, exactly that. The eye is built at every turning, facade, bridge, window and gallery. Come along with me, for a few minutes' tour. I e-mailed a few examples to an artist friend who good-naturedly asked for more; I could have spent the entire trip shooting one luscious display after the other. And sister, does this make your grey tee and jeans look uninspired. That's probably why I bought that Uniqulo tee. While gorgeous young people naturally drew looks (and look terrific in those exuberant styles), I wanted to see women my own age or older, for inspiration. Huguette and I took in the Frantisek Kupka exhibit at the Grand Palais. 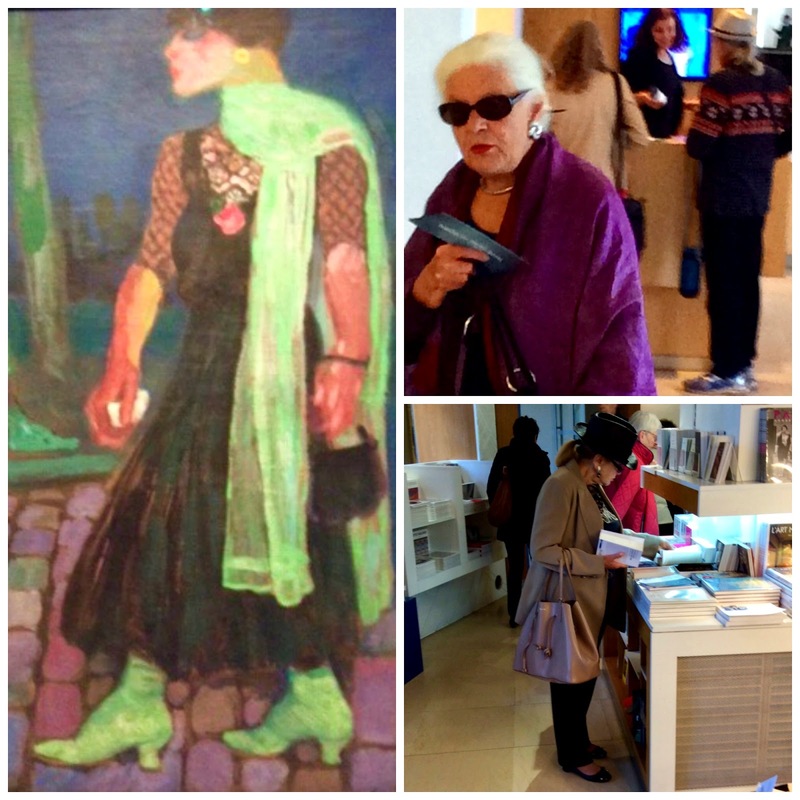 Below left, one of the artists' works, "L'archaique", showing that Parisiennes in 1910 were as arresting as now, and at right, two real-life women, both I judged to be seventy or older. Very different types, but both projected an absolute authority, the famous "bien dan sa peau". Behind the white-haired woman, you can see the back of a twenty-something woman: black athleisure pants, metallic shoes, fedora. How magnificent the elder women look, without following youthful trends, a lesson I summoned when I looked in at a few boutiques. Though windows brimmed with summer accessories (studded sandals, bolero jackets), Paris is at heart a seat of deep tradition, built since its beginnings as Parisii around the end of the third century B.C. I was as captivated by the classic beauty as the glossy new. Left to right: After those tropical cocktail-coloured windows, I first thought strict clothing, a niche occupied by deceptively simple yet feminine clothing in discreet hues (perhaps plum, but not red) was impossible to find anymore. I so longed for that aesthetic that I'd go back to the flat and look at a photo of Annie Leibovitz in her black shirt. But the photo at left shows it alive and assured. Top right: In Paris, I'm brought to a halt by wedding dresses, because they show tailoring literally married to romance. This short dress by Cymbelline is so nontraditionally chic that I stopped in front of it at least a half-dozen times. 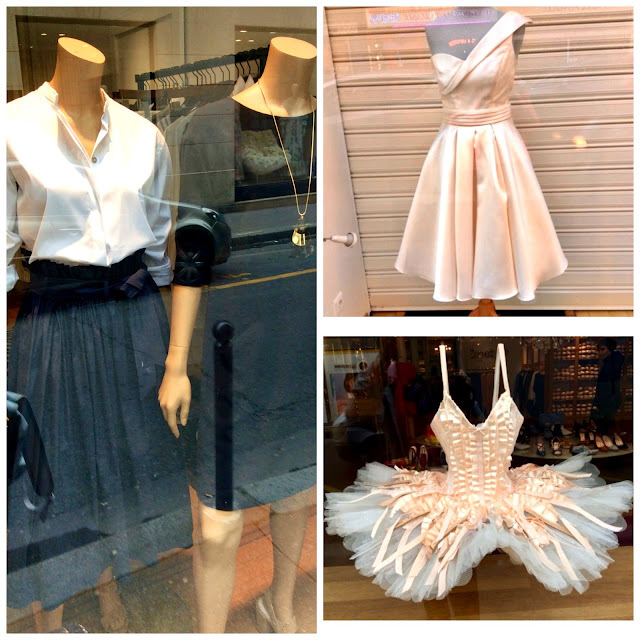 Bottom right: In Repetto's window, a dreamlike, classical tutu that honours the house's history of making ballet shoes. Paris is far more than its goods: the river, rose windows, the scent of muguets in the markets, the crackle of everyone out on a mild Friday night. We come to to appreciate, learn and grow, to spend time together or take off on our own and report our discoveries. Years ago, we told our friend Marcelle that we would go to Paris for two weeks. She threw back a tart appraisal: "Too much of a good thing!" I was baffled by her perspective, but stayed silent (an uncharacteristic response). While enjoying a midafternoon pastry with LeDuc, sitting in the sun at a café, watching street life, I remembered her criticism. Marcelle has been dead for five years, and I thought, Well, old friend, there's your reason: life is short; and so, as Audrey Hepburn said, Paris is always a good idea. It's interesting, I always notice a disparity between the splashy styles I see in shop windows, and the more restrained looks women there are actually wearing. Did you find that to still be the case overall? Thanks for the window pics! 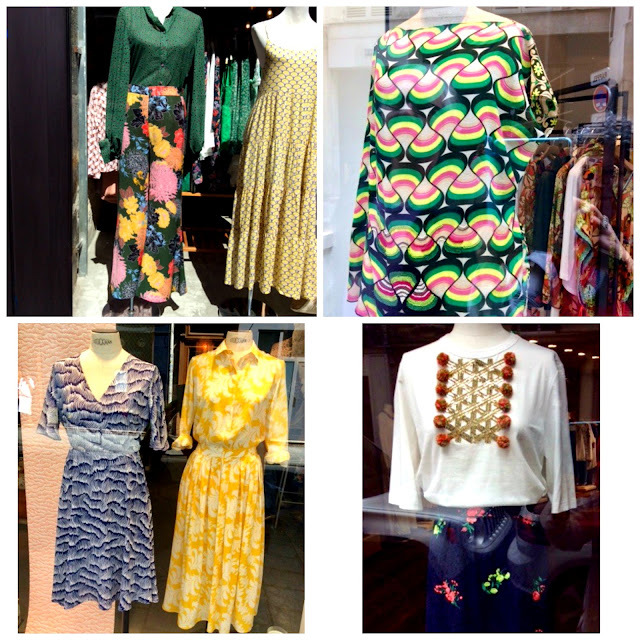 I think I could happily spend the whole two weeks just window shopping (and eating, of course). How could two weeks possibly be too much? Window-shopping in Paris is a great pleasure. You write so beautifully and I loved reading this post. I appreciate your perception of the very good-looking older women's non-trendy style, too. It's been six years since I've been there and I long to go back. It is my favorite place and I treasure the memories of the unhurried days we spent there. Thank you so much. Thanks for this peek into the breadth of French styles. It's always an education to see clothing through your eyes. How did your wardrobe choices work? unefemme: I saw quite a lot of that colour on the street, far more than here in Montreal, where it will not show up. till mid-June. Paris has such different light. Wendy: I wish I had asked her to expand her thoughts. There seems a whiff of anhedonism in it but I may be imagining that. Francie: Hope you can get back; it was fun to see persons having their first look, like a Danish couple we chatted with over dinner. No matter how many times, always special. LauraH: Worked just fine, but I swapped the pink coat for a pink down sweater at last minute, b/ c of cooler days in forecast, and left out rain shoes...no need. materfamilias: Oh, should have left you a note! Enjoy every minute! My last trip to Paris was for two months - bookended by work in Amsterdam, then in Italy. I was very fortunate as a colleague lent her flat as she was away, though of I paid for utilities and made sure to replace all household supplies and add some treats. Fortunately I was able to work there. I suppose I'm not representative as I have friends and colleagues there, and my cat was well cared for back home. I never found it too long, though I had a slender budget - oh, plenty to eat well and invite friends over, but not enough for frequent restaurant visits. And the visit involved archival research and museum visits, as well as a splendid picnic at parc de la Villette with several friends. You will find everything green and beautiful upon your return.